Last night, Christie’s evening sale of post-war and Contemporary art in London totaled £39,149,500, exceeding the pre-sale estimate of £26,290,000 to £38,260,000. More than half of the lots offered sold above estimate, and in selling 9 works over £1 million (16 over $1 million), the auction house easily surpassed the equivalent figure for all three of their auctions of Post-War and Contemporary art in London last year. The evenings auction confirmed that not only has confidence returned to the art market but also that there is a real hunger from international collectors in this market – Europeans dominated the bidding, eventually accounting for 41% of the sales, 22% of works sold to Americans, 31 percent went to Britain. Four percent went to Asia. Particularly strong prices were realized for classic European artists including Yves Klein as well as Joana Vasconcelos and Alighiero Boetti, both of whose work established world record prices.The strong results at our international auctions during the second half of last year encouraged vendors who were previously resistant to consign works of art, and the increased supply of quality works fed a strong demand and led to competitive bidding. The star of the evening was Relief éponge by Yves Klein which sold for £5,865,250 over an estimate of £5 – 7 million. 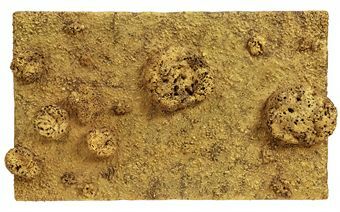 The work is the longer of only two gold sponge reliefs ever created by the artist, it encapsulates the essence of Klein’s art with the marriage of two of his greatest series; the Relief Eponges (Sponge reliefs) and Monogolds. Relief éponge was offered at auction for the first time having been in the collection of the vendor since circa 1980. In addition to the great sale of Relief éponge, and F88 the night before at Sotheby’s, Yves Klein’s Anthropométrie (ANT 5) – the work was last sold at auction in London in 2001 when it had realized £388,500. Last night it doubled pre-sale expectations of £1.5 – 2million eventually realizing a hammer price of £4,129,250 when it sold to the London Jeweler Laurence Graff. 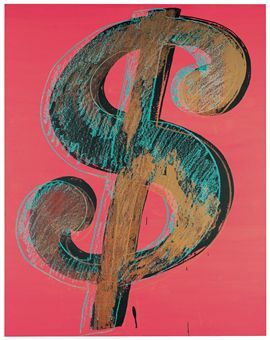 Graff was one of the biggest spenders of the evening – he made the final bid of £2.3 million for an Andy Warhol dollar-sign silkscreen that was made in 1981 – the work had a top estimate of 1.8 million pounds. Another star sale of the evening was the £2.6 million pounds paid by the New York-based dealer Philippe Segalot for Martin Kippenberger’s five canvases Fliegender Tanga, dating from 1982 to 1983 the work was expected to fetch between £800,000 and £1,200,000. This is the second highest price paid for any work by Kippenberger at auction. Marilyn, Joana Vasconcelos Estimate: £100,000 – £150,000. Price Realized: £505,250. Ononimo, Alighiero Boetti Estimate: £250,000 – £350,000. Price Realized: £1,049,250. Elsewhere in the sale, four records at auction added to the success of the evening. 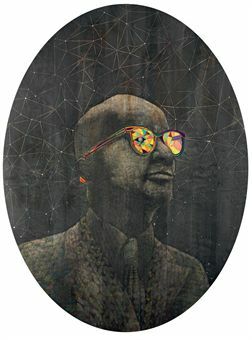 Matthew Day Jackson, who recently exhibited at Francois Pinault’s Punta della Dogana museum in Venice, established a new record for his work when Laurence Graff purchased Bucky – a portrait of Buckminster Fuller – for £601,250 against an estimate £30,000-£40,000. 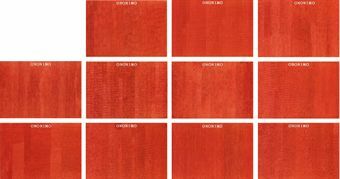 Alighiero Boetti’s set of 11 rectangular essays all entitled Ononimo, exceeded £1 million, nearly tripling the estimate and establishing a new record for the artist. White with Reddish sign by Antoni Tàpies, also set a new record for the Catalan artist as it doubled the high estimate at £993,250. 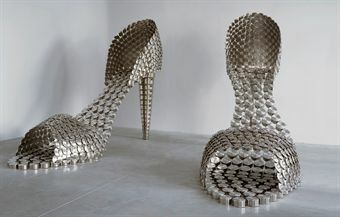 In addition, Portuguese artist Joana Vasconcelos’s set of high heels from kitchen pots, Marilyn, sold for $791,222, over three times its high estimate. These results, along with the success witnessed at Sotheby’s the previous evening, should give confidence to all eyes that watched intently this week for a signal that confidence has returned to the art market. After last night’s auction Francis Outred, Head of Post-War and Contemporary Art, Christie’s Europe encouraged consignors to be confident as we anticipate the next major major auctions of Post-War and Contemporary art that will take place in New York and London in May and June respectively. This entry was posted on Friday, February 12th, 2010 at 3:47 pm	and is filed under Art News, Auction Results. You can follow any responses to this entry through the RSS 2.0 feed. You can leave a response, or trackback from your own site.